We had almost given up on having a vegetable garden because every time we planted something, an animal would come along and eat it. We tried everything we could think of to keep out deer, woodchucks, raccoons and rabbits, including building cages around our beds but nothing worked. A friend told us about Mr. McGregor's Fence and in 2011 we installed a kit for deer and critters as a last resort. That summer was the first time our garden produced a bumper crop of vegies. 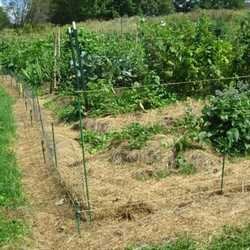 We were amazed at how effective this simple system is and highly recommend it to anyone whose garden gets eaten by animals.